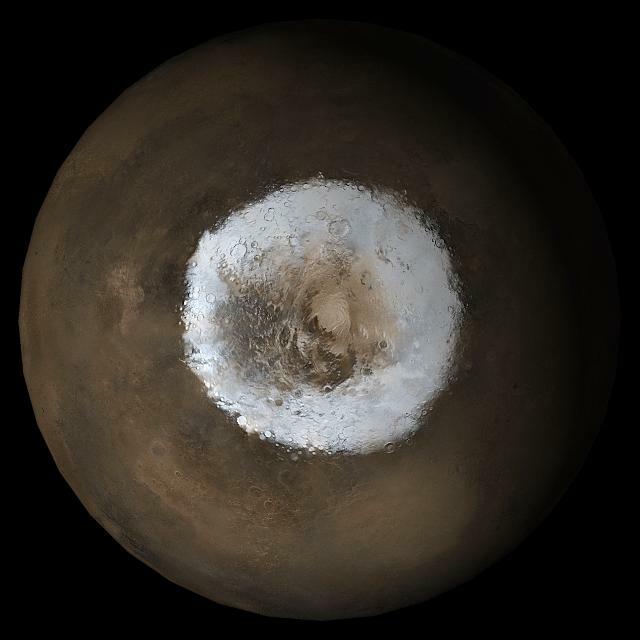 Today's Image of Mars show the South polar cap in early Spring as taken in May 2005. This image is a mosaic of images taken by the Mars Global Surveyor. A lot of this ice is carbon dioxide ice, but with an underlying layer of water ice. By this time the carbon dioxide ice has likely begun sublimating, since the temperatures have begun rising and carbon dioxide ice begins sublimating at temperatures greater than -78.5°C (197.5 K, −104.2 °F). Clicking on this image will take you to the original Mars Global Surveyor gallery where this image is located.